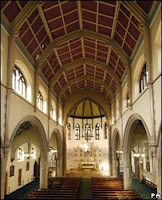 My good friend Fr Gerard Byrne says a Latin (novus ordo) Mass every Sunday at 4pm in the beautiful late Victorian gothic Church of St Patrick's, Anderston in Glasgow. The Mass is a model of good practice for the ordinary form of the Roman rite - celebrated ad orientem, with the parts of the Mass all properly sung in Latin. A small schola sings the parts of the Mass. Once a month, they sing the full chants from the Graduale Romanum and on the other Sundays, they use the Graduale Simplex. New members for the schola would be warmly welcomed. This would be a good opportunity if you would like to learn to sing Gregorian chant. The practice each week is on Wednesday evening from 7.30-9.30pm. Contact email is: schola_glasguensis@hotmail.co.uk. "... by force if necessary"
"As a bishop I cannot be silent"
"Locked in" syndrome and the "vegetative state"